Are We Heading Towards the Next Financial Crisis? 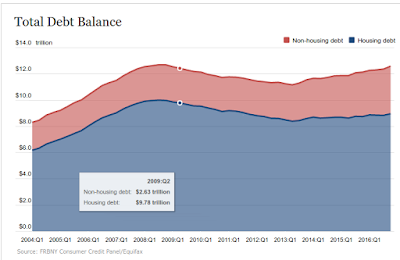 A recent report by the New York branch of the Federal Reserve Board indicates that the total household debt balance is approaching the record peak of $12.68 Trillion, reached in Q3 of 2008. The Q4 2016 number is reported at $12.57 Trillion. 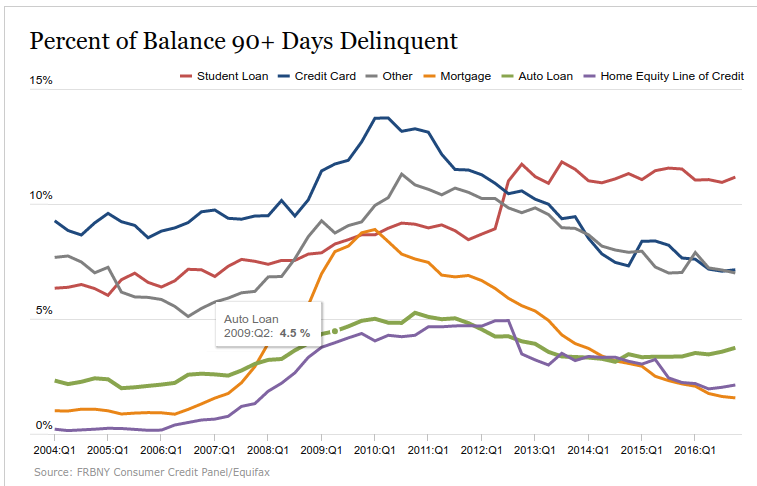 The most alarming fact coming out of this report is that student loan 90+ day delinquency is rising sharply and consistently over the last two decades. The current student loan outstanding balance stands at approximately $1.3 Trillion. The following table (source: FRBNY), clearly shows that student loan default rate leads household debt-component delinquency by far. 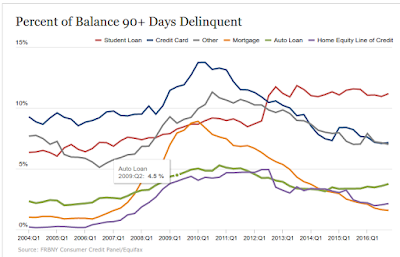 Note that FRBNY has warned in its previous reports that though the current delinquency rate is alarmingly high, the actual delinquency rate, as an indicator, is quite understated, since many student loans payback terms are deferred, while students attend school. Once the deferral period is reached, it is highly likely that we will notice a much more significant rise in the delinquency rate. While students' inability to pay back their loans in a timely manner, affects their credit scores as well as spending ability, in many cases this delinquency affects the economic reality of their parents, when parents co-signed as guarantors on their children's loans. Unlike other types of debt, this type of situation has the "passing-the-buck" effect that binds multiple generations together into Indentured Servitude. The economic impact on households that have a high debt to income ratio could have very dire consequences, as both parents and their children are forced into default. 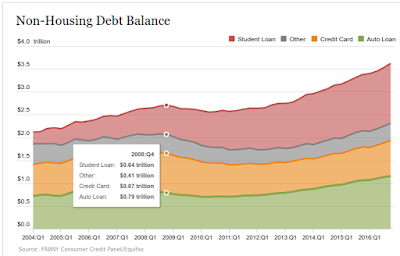 Since our government precluded student loan debt from personal bankruptcy protection, there is currently no mechanism that could prevent a debt crisis. Perhaps it is time to call out our government policies for a major review, regarding investment in education in general and the cost of higher education in particular. It is unclear why we have the most expensive higher education in the world, while other developed countries make higher education completely free for their citizens and permanent residents. With many countries in Europe (Germany, France, Scandinavian countries, etc.) offering free university education, at top universities (see references below), to foreign citizens (including U.S. citizens) are we going to begin shipping our young population abroad to seek debt-free destiny? With hundreds of thousands of H1B visas granted to foreign workers every year and with even greater number of F1 visas granted to students who enter the U.S. workforce through "Optional Practical Training" (OPT) arrangements, U.S. Employers receive the short-term benefit of cheaper labor, all at at the entry level. However, by undercutting citizen children of the middle class in the U.S. from a chance to receive higher education, due to affordability issues, any short-term gain in worker supply will be replaced by a massive downfall and screaming shortages of well educated workforce in the long term. Is it not the time to demand a major revision of the "for profit" approach in higher education? This system went overboard over the last 30 years, making college-level education un-affordable for so many people and enslaved those who received financial support for their education to a lifetime of debt. With the financial sector taking over every aspect of our lives and dominating the political system, are we going to sit at home and see this, once great country, going to the dump, while enriching the top 0.1 percent of the population? Aggregate household debt balances rose to a new peak in the second quarter of 2017. 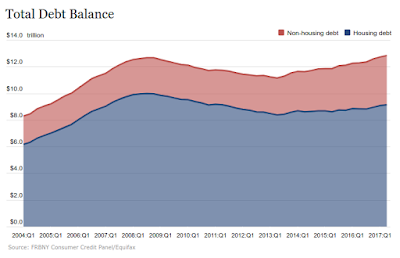 As of June 30, 2017, total household indebtedness was $12.84 trillion, a $114 billion (0.9%) increase from the first quarter of 2017 (the original article reported 12.57 Trillion, or a change of 270 billion since Q4 2016). This increase put overall household debt $164 billion above its peak in the third quarter of 2008, and 15.1 percent above its trough in the second quarter of 2013. I must admit that I was not aware of the current "carnage" and screaming shortages in the fashion model market. Maybe your guess would be better than mine regarding the identity and the interests of the lobby groups who "helped" our government define the above categories; however, the current non-resident worker employment policy of the U.S. are practiced, based upon the H1B categories mentioned above. The table below lists the number of H1B visa petitions submitted by US employers in fiscal year 2016, organized by State rank. The Number of LCA column reflects the number of Labor Condition Application(LCA) filed for H1B Visas. . This number includes new, renewed and transferred LCAs. Note that in some cases the visa sponsors (employers) specify a salary range, instead of a single numerical salary value. In such case the Average Salary column reflects the average proffered salary on the LCA application or the attached Form 9035. Bringing jobs to states like Pennsylvania and finding alternative sources of income for coal miners who lost their jobs was a hot topic in the last Presidential Elections campaign. Some say that the popular climate of feeling disenfranchised from the grand economy of the U.S. is what moved voters to bring about the unconventional results of the recent election. I feel deep sympathy with our coal miners. For many generations their hard work yielded the abundant supply of fuel that was necessary to support the growing energy needs of the U.S. economy. They worked relentlessly in a harsh and dirty environment to give us cheap steel and electricity. 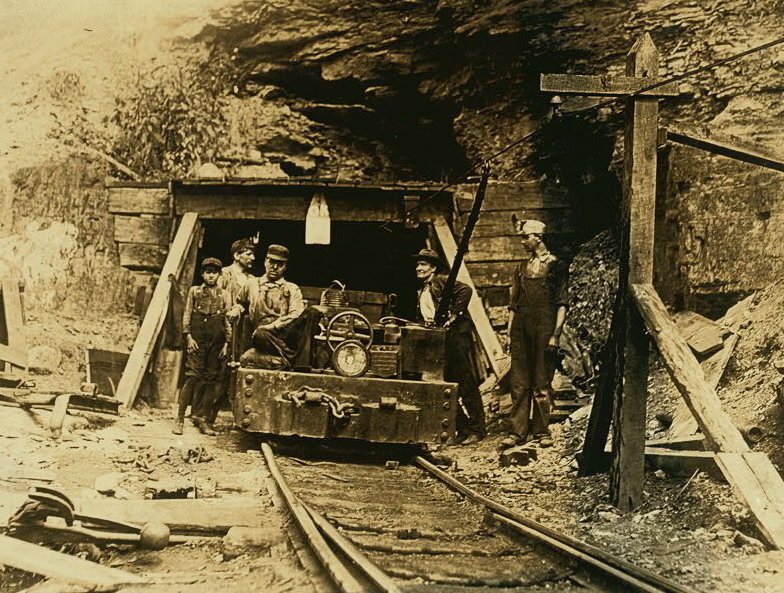 Though it took a lot of struggle through the years, coal miners managed to organize and receive quite decent compensation compared to workers in other sectors of the U.S. economy--an average of $80,000/year (see more detailed information at: http://www.payscale.com/research/US/Industry=Coal_Mining/Salary). The loss of these better-than-average salaries must be devastating to coal miners families who enjoyed a good standard of living for the last 30 years. However, the world did not stand still. As the natural gas industry began major growth throughout the 21st century, natural gas began displacing coal as the major source of energy, due to its abundance, low price, ease of distribution and cleaner environmental footprint. This trend in today's economy cannot be reversed. Coal miners did not loose their jobs to offshore outsourcing--our Capitalist economy simply drove us to consume what we perceive to be the cheaper alternative. Who's Winning The Battle To Replace Coal? The industrial revolution would have had trouble moving forward without coal as its main source of energy. Mine owners looked at their employees as both a disposable and replaceable resource and had no inclination to share their wealth with employees until organized labor came onto the scene. Two social phenomena that had their roots in the mining industry: the Company Store and the Indentured servant practice, would be considered unacceptable in today's democratic society, though they prevailed until the second half of the 20th Century. In Fiscal Year 2014, 72% of H-1B holders were between the ages of 25 and 34, according to the USCIS "Characteristics of Specialty Occupation Workers (H-1B): Fiscal Year 2014", Table 5 of the report denotes that only 3,592 of the 315,857 H-1B visas were approved for workers over the age of 50. Computerworld has reported on H-1B age discrimination within the program, and in the case against Disney World's H-1B replacement tactic, age discrimination is an aspect of 2015 court filings. 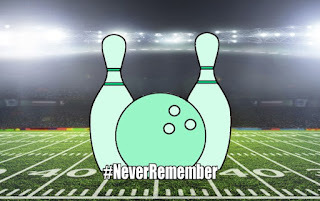 The 1300 Intel employees who were laid off by Intel Corp. in 2015 and the 15,000 employees whose employment with Intel corp. was terminated in 2016 probably feel that there is a direct connection between the H-1B hiring practices and the company's layoff practices. Replacing older employees, whose salaries are relatively high compared with new and inexperienced employees is one way of reducing the cost of labor. Since H-1B employee salaries are even lower than those of domestic employees, the Corporation is happy to reap the rewards. From Intel Corp. 10-Q filings we can deduce that the company replaced laid-off workers with new and younger ones, since the overall number of employees reported on these government mandated reports seems to remain almost the same. Regarding the age discrimination aspect of Intel Corp. layoffs, we have statistical evidence that points to direct correlation between an employee's age and his or her probability to be selected for layoff (see: http://www.pdx-tie.org/2016/08/useful-diagrams-for-explaining-intel.html). Throughout the Obama administration years, no one paid attention to the merits of the H-1B visa program. However, nowadays when President Trump is criticizing the H-1B visa program and declares that U.S. companies must hire U.S. Citizens and permanent residents first, all hell breaks loose in the "high tech" sector and CEO's who were all jazzed up about Trump's suggestion of corporate tax cuts, suddenly declare him the enemy. Specifically regarding Intel Corp., it is unclear for me how the company can declare that almost 20,000 employees laid off over the last few years, are banned from being reemployed for life, all while driving a campaign demanding to increase the number of H-1B visa recipients that it would like to sponsor. One of the issues that without a doubt is very tempting to large corporations, is the fact that H-1B employees are in fact indentured servants. These employees are willing to work for lower than market rate compensation and have complete dependence on their sponsor for staying in the U.S. This practice is only a few steps away from the old coal mining days of the U.S. economy, when mine owners kept armed gangs of hired thugs to keep the miners in check and the Company Store was the only place where miners could find food. English author Eric Arthur Blair, under the pen name George Orwell published "Nineteen Eighty Four" (also known as "1984") back in 1949. Though Orwell wrote other popular books, like "Animal Farm" and several collections of essays, like "Shooting an Elephant" and "Inside a Whale", the "1984" novel remained iconic in its relevance for social commentary, throughout this day. 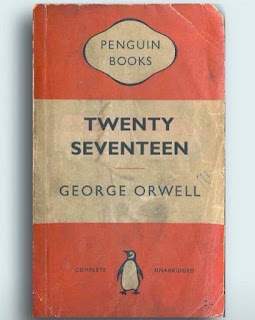 Certain terms from the book ("big brother", "doublethink", "doublespeak", "newspeak"), became regular metaphoric expressions in the English language. The novel is set in Airstrip One (formerly known as Great Britain), a province of the superstate Oceania in a world of perpetual war, omnipresent government surveillance, and public manipulation. The superstate and its residents are dictated to by a political regime euphemistically named English Socialism, shortened to "Ingsoc" in Newspeak, the government's invented language. The superstate is under the control of the privileged elite of the Inner Party, a party and government that persecutes individualism and independent thinking as "thoughtcrime", which is enforced by the "Thought Police". I remember reading the novel in school, during the mid 1960s. At the time, 1984 looked like the distant future and the story line seemed like many other Sci-Fi books that I read--impressive, yet too wild to believe. In 1984, during the first term of the Reagan administration, some people commented that the prophecy of George Orwell failed to deliver. Perhaps they took the title of the book too literally. 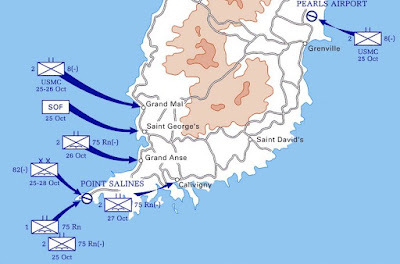 However, the invasion of the tiny island of Grenada by combined action of all branches of the almighty U.S. military (Seeking glory after Vietnam?) 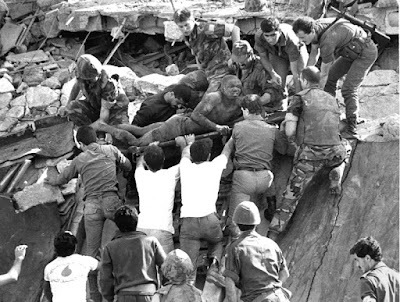 as well as the Iran-Contra affair (involving the discovery of clandestine actions of the CIA in Latin America and subsequent cover-up by the president's staff), reminded all of us of the danger in letting government run unchecked. Many people's lives would have been spared if we gave proper attention to these breaches of government-run-amok, during the Reagan presidency. 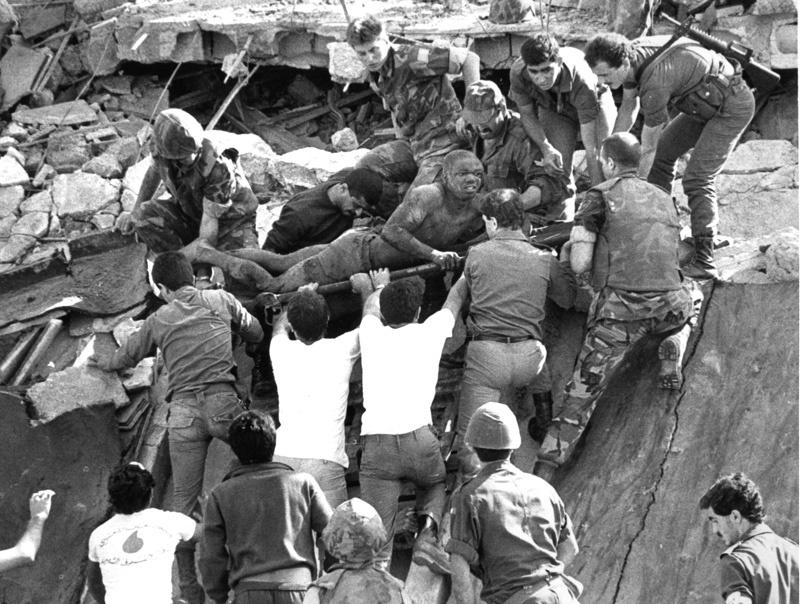 If Reagan would have been impeached for his actions in the Iran-Contra conspiracy, it is likely that George W. Bush's invasion of Iraq following 9-11 and the complete destabilization of the Middle East resulting from that action would have not consequently taken place. The fact that the U.S. stands alone among all developed nations, lacking affordable medical healthcare to serve its whole population, indicates where national priorities stand in the minds of those who control government. Lack of affordable Nation-wide medical insurance, prominently appears in sharp contrast to the more than 340 military bases and installations that the U.S. keeps around the world. Most of these facilities are remnants of the U.S. military deployment at the end of WW-II and serve doubtful purposes in this day and age. It is likely that if we followed the money trail, we will discover some fascinating facts about how our tax dollars are being spent. To hear President Trump talking about "Making America Great Again" by pledging to increase military spending, while vowing to repeal the Affordable Care Act, seems like a major priority screw-up. Are we really better off as a nation, killing more people abroad, than taking care of the folks here, at home? President Trump's continued apocalyptic declarations of "carnage" in the U.S., streets and militant attitude towards the rest of the world indicate that he is intent on consolidating presidential powers by creating a "State of Emergency" in which constitutional rights will be suspended. The president's dystopian view of the world seems to be taken directly from Orwell's "1984", even when careful fact checking completely contradicts almost all of his assertions. Relying of "Alternative Facts" will lead to "Alternative Reality", which will, without a doubt, bring in many unintended consequences for doubtful gain. It is not clear to me how the United States of America would be better off bringing on the Apocalypse, instead of focusing on leveling the playing field for workers and providing affordable healthcare to the general population. Conway insists that this (fictitious) incident provided reason for President Trump's executive order to ban entrance visas from passengers who come from seven predominately Muslim countries. This is not the only time that Conway has fabricated facts. She continues to behave as if she is participating in a high school debate and high rhetoric is replacement to substance. Generally, it seems that Conway's world is free of consequences and that her purpose in life is to spill words into the air in an attempt to steal all the oxygen in the room. Conway's style of expression definitely qualifies as Orwellian "newspeak". As someone once told me, "too many people confuse their talent for the success of the company". The success of Conway's campaign has nothing to do with her talent--it has to do with betrayal of the plebiscite by the political establishment, on the right and the left. With her track record of lies, what is the reason that Conway is still being interviewed by journalists? If they really care about her they should run a fundraiser to pay for her therapy sessions. Overreaching executive powers are dangerous and have led us to very costly avenues. Presidents that came from either the right or the left continued to demand increasingly more power for their jurisdiction. With all the outcry over the actions of the Bush administration, President Obama inflicted major blows on personal privacy and expanded the powers of government agencies to go after individuals and even justified extrajudicial killings of American citizens. While the Obama administration and the U.S. Congress acted mostly behind the scene, the Trump administration already declared it intention to double on the deeds of its predecessor with blood thirsty overt declarations of its intent to consolidate power in the executive branch and threaten other world countries. Political party loyalties make people do things that they would never dream doing, even when the party seems to work against their best interests. Rebelling against the perceived establishment makes people do things that they would have never dream doing, sometimes to the point of masochism. Is there a way to advance the collective cause without breaking the system? I will be happy to hear your ideas. I personally question if there is any sense in maintaining the current political parties in the U.S. and if the population is actually being served by either one of the two dominant parties. It seems like too many special interests groups are intent on keeping the current political system rigged to advance their narrow benefit. Group representation is being sold to the highest bidder, while the agents reap all the benefits. You may be happy to know that the underlying problem for this situation has been researched and has an official name. It is known as the Principal-Agent Conflict (see: https://en.wikipedia.org/wiki/Principal%E2%80%93agent_problem). Competition seems to be too ingrained in Americans' minds as the only way to advance through life and cooperation always seems to be an inferior choice. 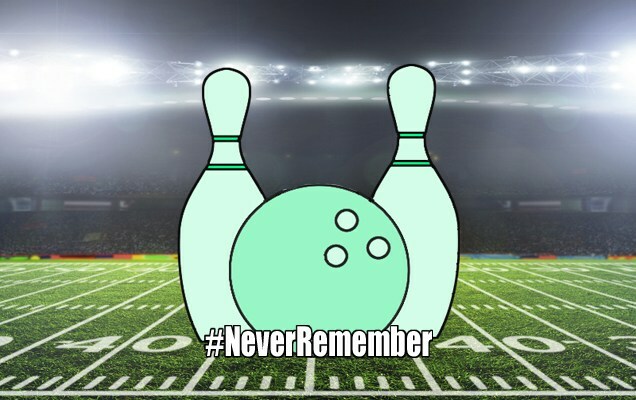 For one reason or the other, there is a popular trend to simplify everything in social space into the terms of a football game--where only one team can win, even if the win does not last, or is only symbolic. On the other hand we also see signs of social trend reversals--perhaps a counter-culture. Young people are more willing to share and participate in community-based endeavors and invest their time and money for what they perceive is a collective gain. There is evidence of the "sharing economy" and the many ideas that it can foster, in spite of their complexity, has a potential of expanding the economy beyond where the capitalistic system can reach. I do not believe that the economic models are mutually exclusive. There is plenty of space for cooperation and competition to coexist, as long as the outcome of these endeavors is to the benefit of the general population. I see the writing on the wall. If money remains in politics, we are all doomed. Perhaps it is time to go to the streets and revive the unity of the nation, not by destroying property and harming people whom you do not agree with, but by voicing the will of the people in a direct and non equivocal way. Apathy will not bring a better quality of life and prosperity for our kids. The EEOC filed its law suit against the Texas Road House for practicing age discrimination against older workers. The law suit is referenced as: Civil Action No. 1:11-cv-11732-DJC, filed in U.S. District Court for the District of Massachusetts. The law suit claims: The EEOC alleged that Texas Roadhouse has hired significantly few “front of the house” employees 40 or older in age. In addition, Texas Roadhouse allegedly instructed its managers to hire younger job applicants. For example, Texas Roadhouse emphasized youth when training managers about hiring employees for its restaurants. All of the images of employees in its training and employment manuals are of young people. Individuals who believe they may have been denied a position at Texas Roadhouse because of their age or who have any information that would be helpful to the EEOC’s suit against Texas Roadhouse should contact the EEOC toll free at (855) 556-1129 or by e-mail at texasroadhouse.lawsuit@eeoc.gov. Note: Peter Gosselin continues to investigate age discrimination in employment cases and is particularly interested in talking to people who have experienced such illegal treatment by their employer. These days that our government is showing a great tendency to pursue the interests of Big Business, while the 70-80 million population of the Baby Boomer generation is heading into uncertain retirement, it is crucial to insure that corrective actions will take place. Age discrimination has been the "big elephant in room" for a long time. Big Business took advantage of weaknesses in the way Congress phrased civil rights protection against age discrimination and deterred affected employees from taking legal action against their employers. The EEOC final rule of 2012 removed some of the ambiguities of the ADEA law; yet, very few legal actions were followed by the EEOC. If the new administration proves to act against the interest of the voting population by blocking protection of older workers' civil rights, then perhaps it would be time to mobilize older workers to march into the streets. Older workers tend to be more active in casting votes than the general population and I fully expect that politicians who ignore their plight will be punished for their lack of corrective action. On the other hand, perhaps our new President, will see the light of day and understand that pursuing protection of civil right for millions of Americans is what can make America Great Again. Perhaps members of the U.S. Congress will understand that the elections of 2018 are around the corner.